At 14,508’/4422m Mt. Whitney is the highest peak in the lower 48 states. 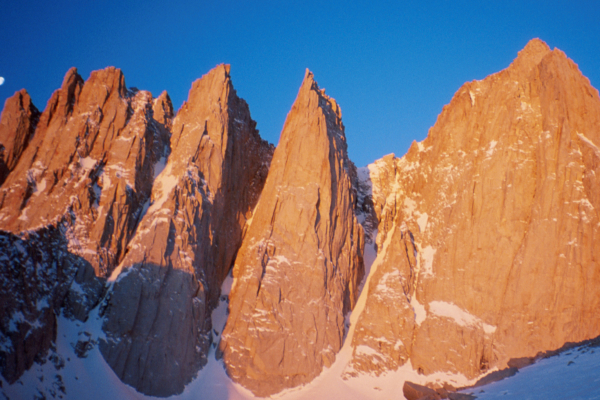 It is also one of the most sought after mountains in North America. During the winter and spring months the Mountaineer’s Route is full of snow and is a classic mountaineering challenge. 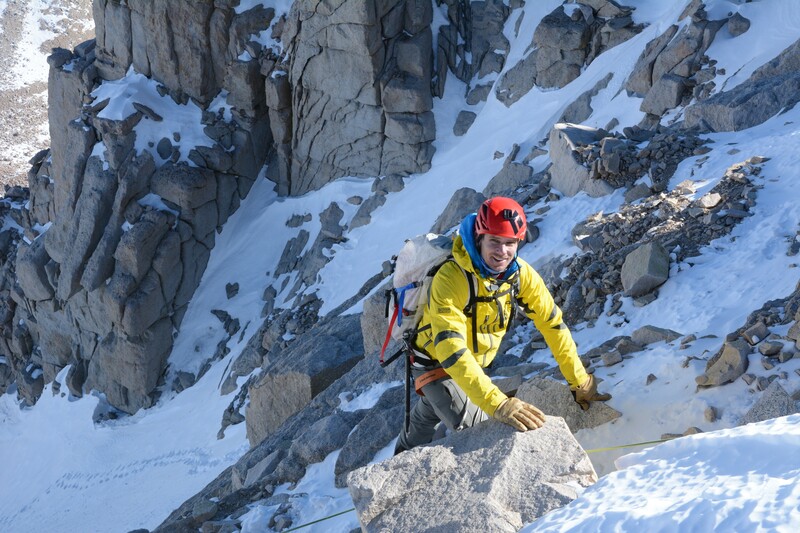 Crampon, ice axe, and rope travel skills are necessary as well as fixed line and in some conditions running belays are employed. 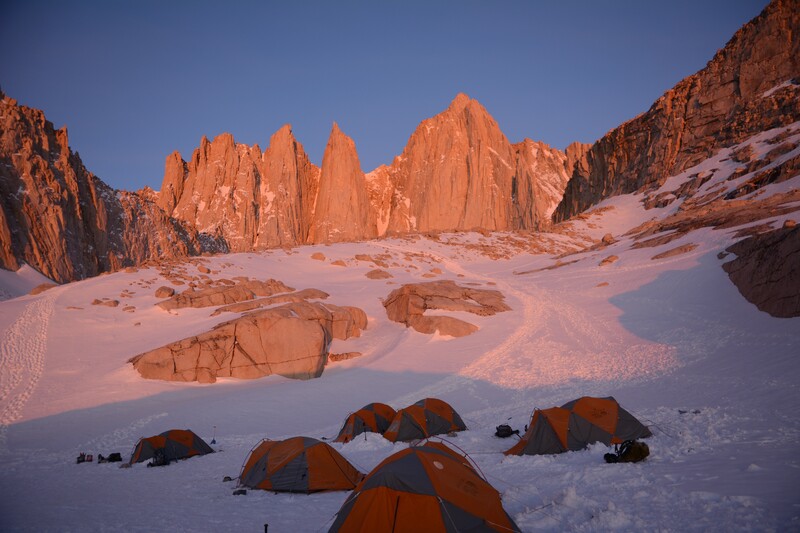 Over the four-day climb we will set in two expedition style camps with the highest located at the base of the spectacular East Face of Mt. Whitney. This 25-45 degree climb offers an excellent opportunity to learn and review skills applicable to climbs such as Mt. 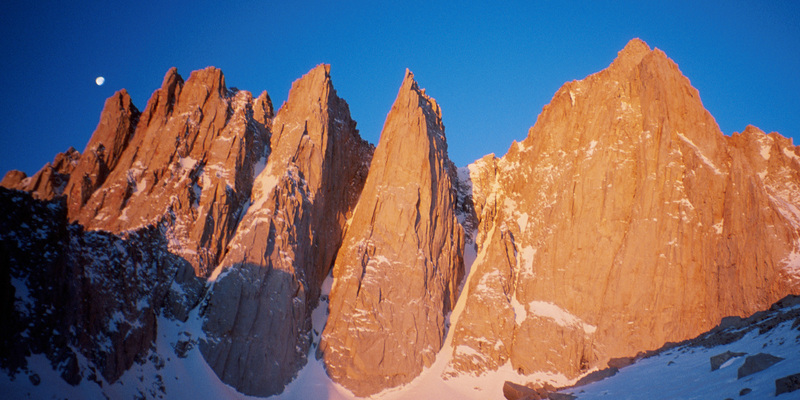 McKinley, peaks in South America, the Alps, Russia, Nepal, and other big snow climbs. It is also a good time to test and get comfortable with any new equipment you may have acquired since your last big climb. 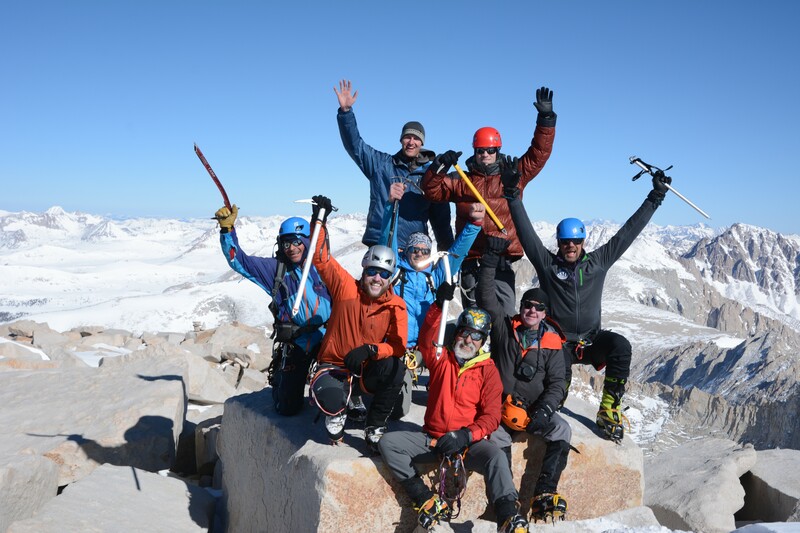 Join us and learn why winter/spring climbs of Mt. 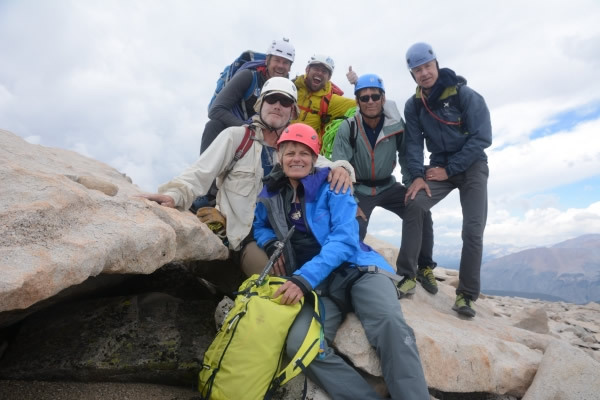 Whitney’s Mountaineer’s Route have become the single most popular program SMI runs in the Sierra! Contact SMI for custom dates or private guiding rates. Day 1: The group meets at the nearby town of Lone Pine on the first day of the trip. 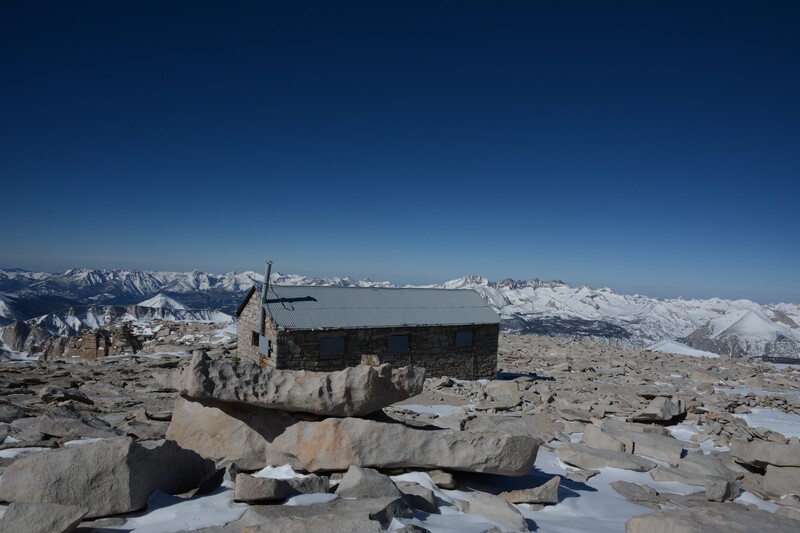 We will drive as far as the snow will allow us to which is usually within a mile of the summer trailhead at Whitney Portal. 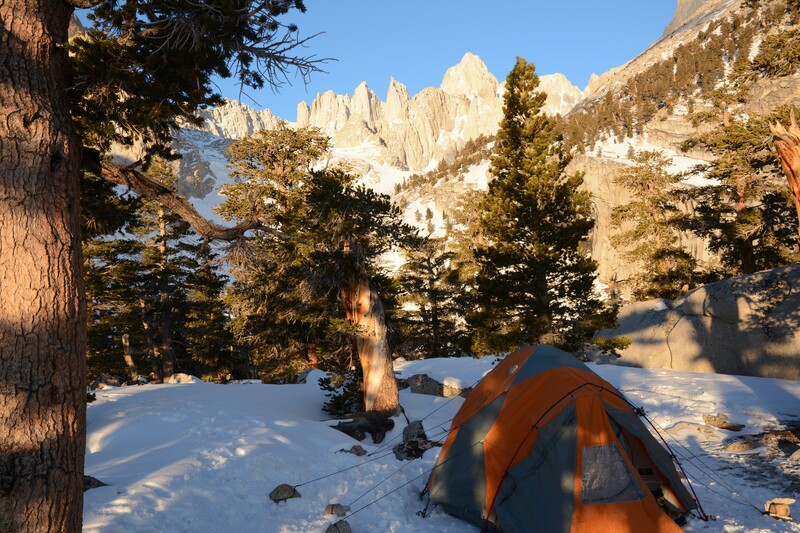 We will ascend the North Fork of Lone Pine Creek and put our first camp in at Lower Boy Scout Lake at 10,350’/3155m. 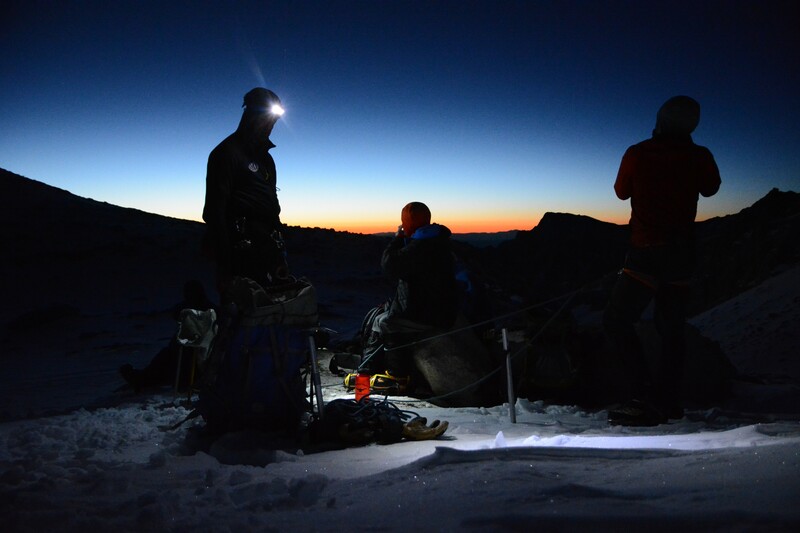 Day 2: We move to our high camp to 12,000’/3658m in preparation for our summit bid the following morning. Day 3: Summit day on the Mountaineer’s Route. We wake before sunrise beginning our ascent in the early morning hours when are treated to a breathtaking sunrise en route. Above Iceberg Lake (12,610’/3844m) we enter the Mountaineer’s Chute along the north side of Mt. Whitney. The slope angle runs between 25-35 degrees to a notch at approximately 14,000’/4267m. 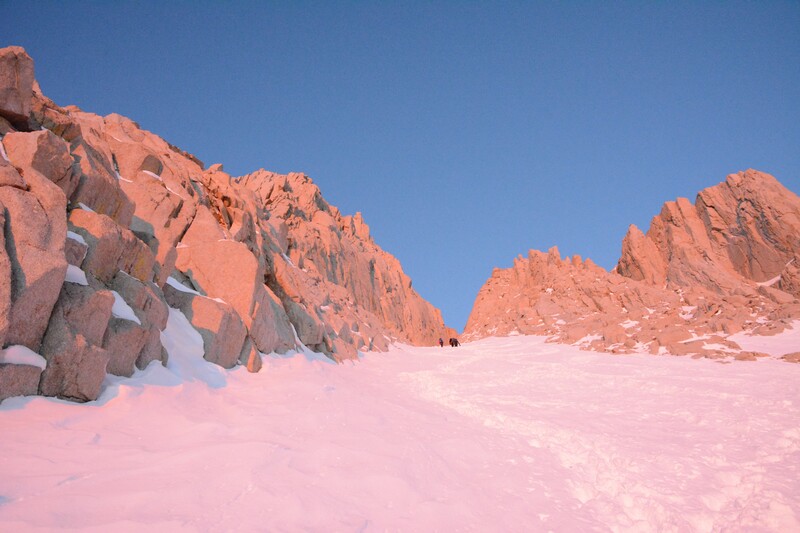 During the spring months the route is full of snow and will require crampons and ice axes. From the Notch the terrain steepens to an angle of 40-45 degrees. The route tops out at Mt. Whitney’s summit plateau and a short 5 minute walk brings us to the top. We retrace our steps on the descent back to camp. Day 4: is devoted to descending back to our cars and are usually back between 12-2 PM. There is time during this trip to review/refresh techniques needed for this climb including ice axe self arrest and cramponing skills. For a full day of thorough review, keep reading to learn about our Whitney Prep/Basic Snow Travel Course. 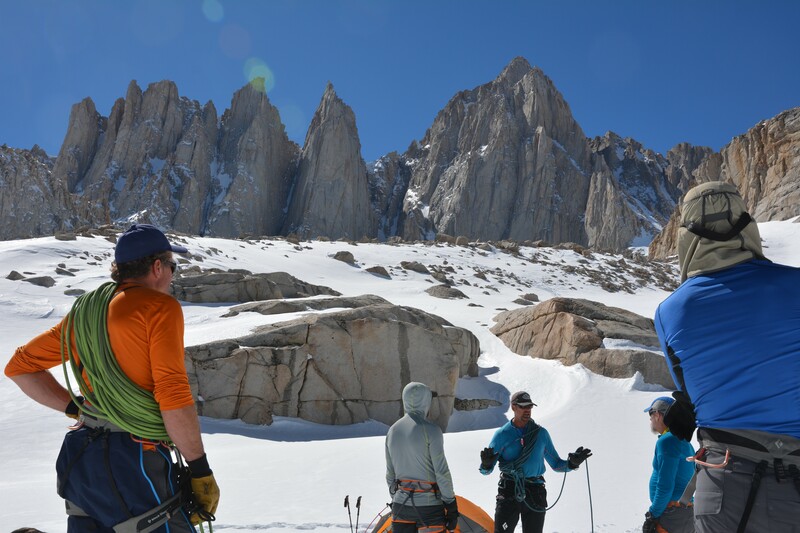 This course covers the basics of travel on snow and is a great way to prepare or review your skills for a climb of Whitney. 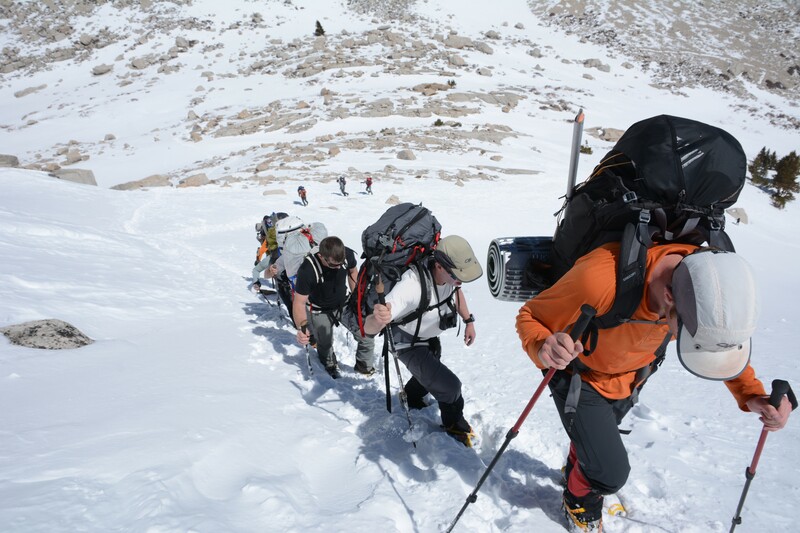 Techniques practiced include use of an ice axe, efficient methods for walking up and down on snow, cramponing skills, travel roped together with other people, all four positions in self arrest techniques and belaying on snow. 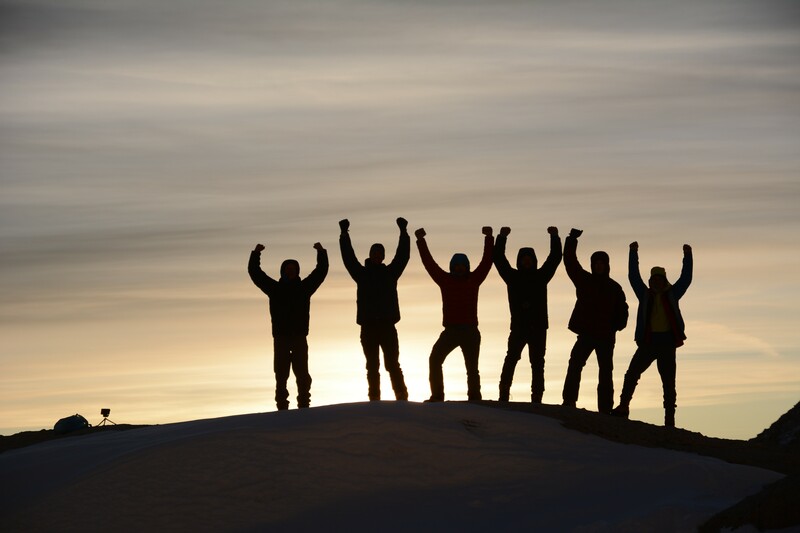 This course provides practical knowledge applicable whether you plan on climbing snow covered peaks throughout the year, or your backcountry adventures are mainly during the summer months with an occasional snowfield to negotiate. Visit our Basic Snow Travel page for more information and dates.